A class of pesticides called neonicotinoids have faced scrutiny in recent years for potentially contributing to bee declines. If bees decline then many plants will go un-pollinated, including important crops we rely on for food. However, the extent to which neonicotinoids are to blame is not fully understood, and three neonicotinoids are currently under restriction within the EU while more evidence is gathered. To date studies looking at the effect of neonicotinoids on bees have either been in the lab, or in the field where colonies are placed next to treated crops. However, lab studies are often unrealistic, and field studies are difficult to control, meaning other factors in the environment could play a role in any changes to the colony. Now, in a study that balances the pros and cons of these two approaches, a team led by researchers from Imperial College London have developed a way of housing colonies in the field. This allowed them to control pesticide exposure and closely monitor colony activity and development. 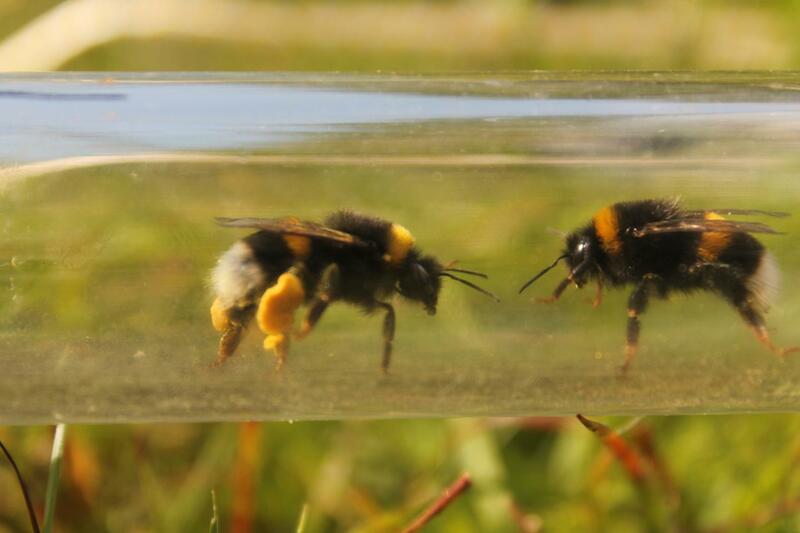 Unlike some previous studies they did not find any large effect on bee foraging behaviour following neonicotinoid exposure. However, they did find evidence that the colony produced a lower number of new queens and males, which underpins colony success. The results are published today in the Journal of Applied Ecology. Senior author Dr Richard Gill from the Department of Life Sciences at Imperial said: "Neonicotinoids found in the environment are unlikely to directly kill individual foraging bees, but when exposure is relatively persistent and combined with other stressors associated with land use change, they could have detrimental effects at the colony level." Lead author Dr Andres Arce, also from the Department of Life Sciences at Imperial, add: "Sub-lethal effects like this are important to consider in pesticide risk assessments, and our study provides a helpful method to determine long-term effects on colony health in the field under controlled exposure." The team placed pairs of bee colonies in a rural setting that was not near any farms, to reduce the possibility that the bees would pick up other pesticides from the environment. One colony from each of the pair was then supplied with neonicotinoids mixed with a nectar substitute. Although supplied with nectar, the bees still needed to forage for pollen, which the researchers used to assess their behaviour. Each colony was housed in a box with a tube for entrance and exit. When bees returned through the tube with pollen, the researchers either snapped photos of them or took the pollen from one of their pollen baskets. The amount of pollen brought back per bee and per colony was measured across the day for five weeks. The make-up of each colony was also measured at the start and end of the study and compared across colonies. The team hope to improve the automation of the study to make it as easy as possible for companies to test new pesticides in ways that reflect real-world scenarios.